Centuries ago, pearls were considered the most valuable gemstones in the world. Whoever possessed a string of equally sized and shaped pearls was a rich and powerful figure. In the ancient Roman Empire and Egypt, these perfect lustrous miracles were a symbol of wealth, power, and taste. A pearl engagement ring represented harmony and humility and was used to seal the love of two people in the purest of ways. While the pearl engagement rings’ meaning is still kept nowadays, the 19th century heavily popularized the diamond engagement ring (mostly by DeBeers). Today, we consider such rings as being “traditional” and “standard” and almost forgot about the beauty and the exquisite simplicity of a pearl engagement ring. However, antique and vintage pearl engagement rings are making a huge comeback, catching up with our modern times. While diamonds are still preferred, the issues related to conflict diamonds left room for other trends to emerge. Contemporary and non-traditional engagement rings trends are now featuring a myriad of combinations and designs, highlighting different precious or semi-precious gems, metals, settings, and styles. Among them, the pearl engagement ring seems to re-conquer its rightful place as one of the most outstanding, refined, and elegant and sophisticated pieces of jewelry. Our short guide will help you choose the perfect pearl engagement ring. 1. Why Should You Go for A Pearl Engagement Ring in the First Place? Men might not know this, but ladies do: pearls, no matter their color, type and size, go with everything in terms of skin tone, personal fashion style, and chosen outfits. A pearl engagement ring, be it white, black Tahitian, rose pink or gold, be it featured in diamond sets and settings, be it simple or placed in an intricate design, it won’t come off your finger under any circumstance. It goes great with office attire, jeans and casual outfits, evening gowns and professional uniforms as well. 2. What Is the Criteria for Choosing a Pearl Engagement Ring? Before anything else, you need to follow a thorough guideline on how to choose the pearl itself. You need to take into account its type, hardness, luster, provenance and the seller’s guarantee policy. But beyond these mandatory rules to follow when buying any type of pearl jewelry (from pearl pendants to pearl necklaces), when it comes to choosing the perfect pearl engagement ring, you should also pay attention to some very important factors. The color is a very important choice factor. Keep in mind that the more vibrant and unusual the shade is, the more expensive the ring might be. White pearl engagement rings are the most common on the market, but if you want to step up your game, you can always look for black pearl engagement rings or even gold pearls ones. You should choose those who compliment the color and tone of your skin, so you can benefit their maximum iridescent qualities. An Audrey Hepburn classy pearl engagement ring comes in a sparkling white shine, while contemporary ring settings also feature dramatic hues, such as green, silver, purple and marine blue. If you get to pick your own pearl engagement ring, look closely at the pearl’s luster. Its surface should be smooth, reflect light and emanate a subtle charm to fall in love with. Just like diamonds, pearls also come in different sizes and shapes. Ranging from large to small (and from round to oval) pearls are so versatile and exciting, most contemporary jewelry designers have a blast in creating ever-surprising settings. 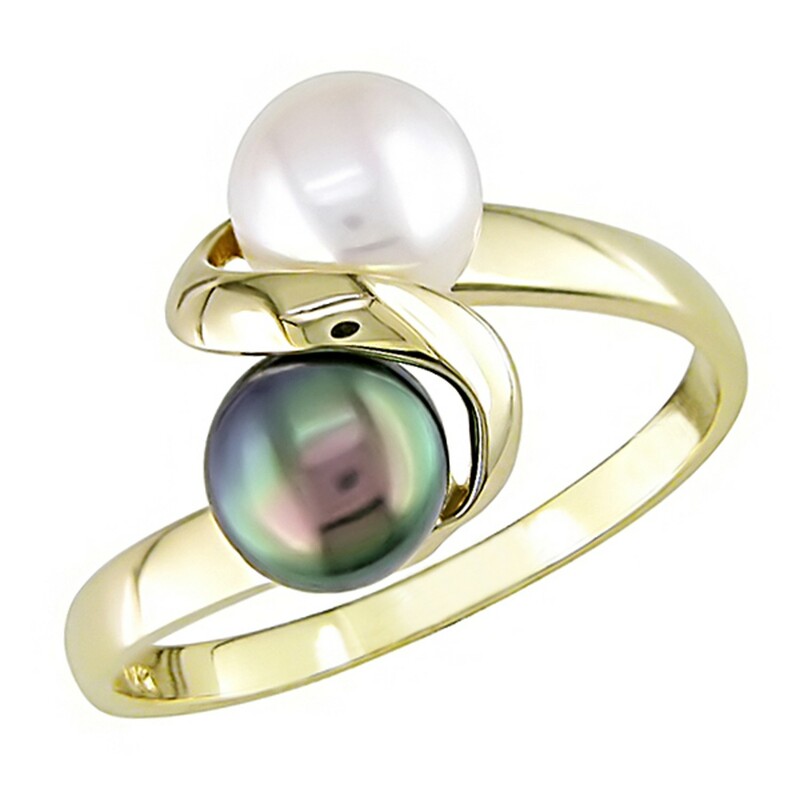 Some consider a medium-sized pearl, roundly shaped, is the best decision when it comes to wedding rings. They are easy to wear and stay safe from casual and daily accidents. Large pearls don’t allow complicated contemporary settings, as they “steal” the show and, together with other gems and stones, might look bulky and inelegant. 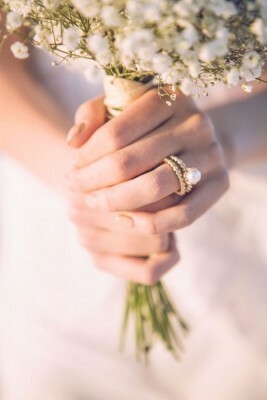 On the other hand, gorgeous modern engagement rings can also feature many smaller pearls, not just one, in refined settings which can make your mother and bridesmaids burst into tears of emotion. Now this is one of the most important factors to take into account when buying the ideal pearl engagement ring. Pearl engagement rings come in antique, classic, Victorian, vintage and contemporary settings. Pearl and diamond engagement rings are probably the most popular choices, but depending on a particular setting, you can get a unique and timeless ring. Prong setting: this is the most popular engagement ring setting, whether it features a solitaire diamond or a single pearl. The pearl is placed in a cast containing two, three or more metal prongs which act like claws, holding the pearl safely into place. 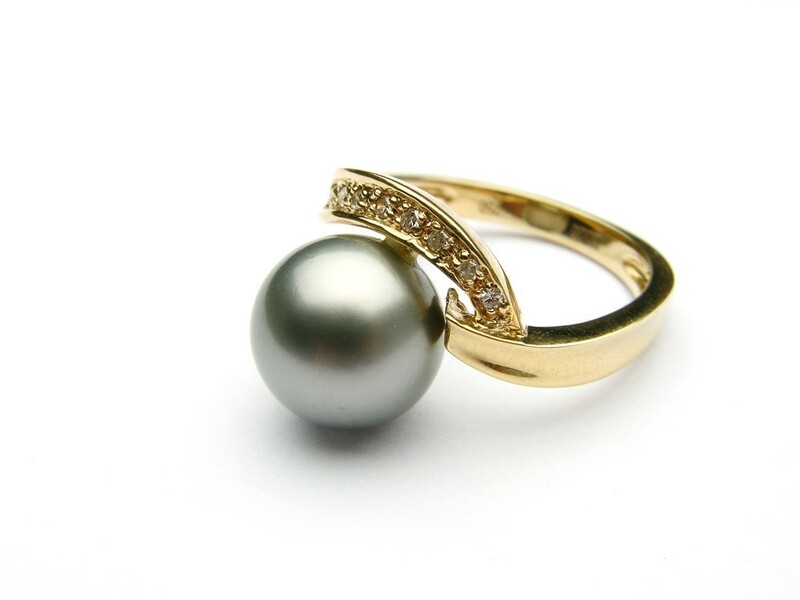 Bezel setting: while extremely popular in diamond rings, such setting is adaptable to pearls as well. A metal rim (extends slightly above the pearl girdle) encircles the mounted gem. Pave setting: just as its name says, this setting features small pearls paved on the surface of the ring. The great thing about such exquisite setting is that the ring gives an illusion of being made of pearls, not just covered in them. Halo setting: also inspired from diamond rings, this setting features a centerpiece pearl surrounded by a circle of smaller ones, usually in a different color. Surely, this is just the beginning when you start shopping for a pearl engagement ring. After you decided on the setting, everything that comes afterward is just a matter of taste and personal style. Pearls go great in combination with many other precious stones, as depending on their color and glow, they can highlight the pearl: sapphire, ruby or emerald as accents stones, white diamonds for an eerie halo effect and black stones, crystals and colored semi-precious gems as well. White gold, yellow or rose gold, platinum, and silver sterling are the most popular. However, contemporary pearl engagement rings can also be mixed with titanium or other metal mixes. 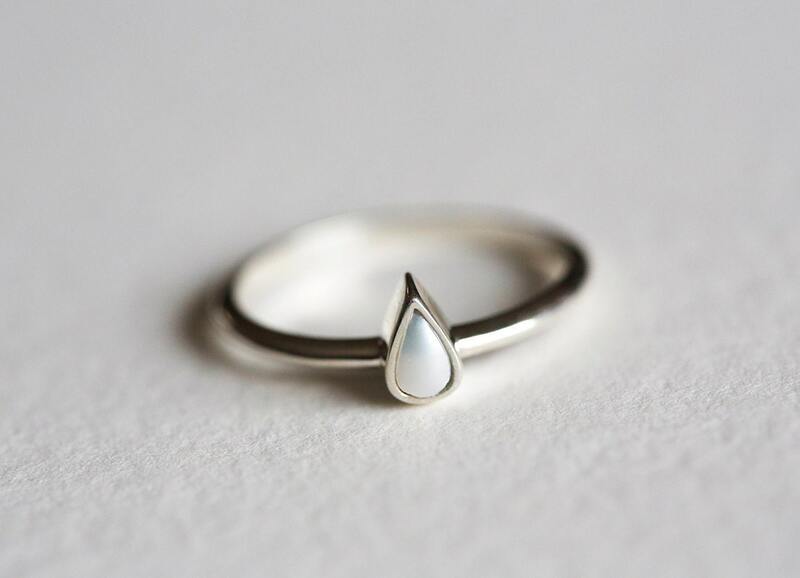 The ring band is as important as the pearl and setting themselves. If you decided what type of pearl you want and what ring setting you are willing to wear for the rest of your life, it’s time to visit some jewelry stores. Chanel and Tiffany may be on top of the list, but there are plenty of boutique jewelry stores and online shops to treat you with the same respect and offer you the best possible quality at affordable prices. S., Canada, the U.K. and Australia have pretty impressive pearl-centered jewelry shops you might want to browse. Pearls are vulnerable to time and wear, so try to find a store offering a lifetime warranty. As an alternative, ask the jeweler about their policies on pearl engagement ring maintenance, repairs or gem replacement. Always test the pearl for being real or fake with the Tooth Test. Your pearl engagement ring should be unique and special, no matter how it looks. Make sure you buy quality, elegance, durability and timeless style! This entry was posted in PearlsOnly Blog and tagged gold pearl engagement ring, pearl engagement ring, pearl ring by PearlsOnly Team. Bookmark the permalink.